Finding cat toys your kitty will love is actually harder than you might think. Felines are naturally independent. Their nature to defy and confuse their owners is part of their charm. Your first cat might have enjoyed the laser pointer but that doesn’t mean your next cat will. Cats are born predators. They love to stalk, pounce, and dig their claws into their prey. 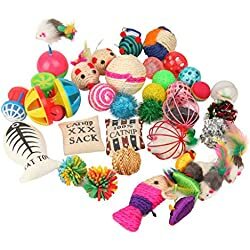 Find a cat toy that meets these basic instincts, is a match to your particular cat’s preferences, and let the fun begin. Cats like to sleep, but they also like to play (although most of the time it is not when or how you want to). The cat is somewhat aloof, and therefore, may choose not to engage with a certain cat toy or that one particular toy you picked out because you thought for sure they would love it! You’ll have to test some out to see how things go. You can always donate the ones that don’t work to a shelter if your cat really doesn’t go for it. It is important to give your cat some daily exercise to prevent obesity. Don’t forget to give a gift to the cat lover in your life; they deserve a special treat as well this holiday season. This puzzle also serves to slow down your cat if they are a fast eater. The tails are made of silicon, and you can easily rotate them around to change the puzzle continuously. The tails are removable for cleaning and are dishwasher safe. Your cat will love fishing kibble or treats out from the tails into the trough. 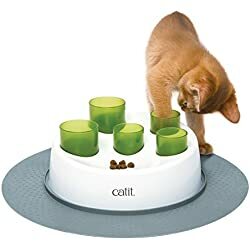 A cat toy that serves multiple functions! 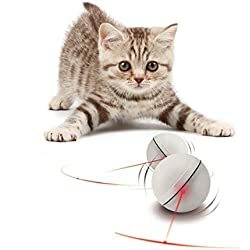 This cat toy has a multi-directional remote-controlled mouse that your cat will love to chase around the house! The mouse is easy to operate with an easy, handheld, one-button control. This is a cat toy they will not be able to resist. You can create jerky motions which will give your cat exercise as they try to retrieve the mouse filled with catnip. This cat toy contains two cat tunnels which will accommodate small and large cats. One tunnel is long (35″) and one is short (18″). Both are 10″ in diameter. 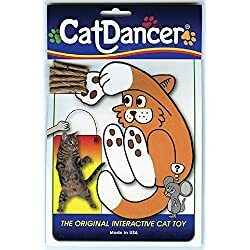 A great interactive cat toy! Cats love to run into tunnels, and the crinkly fabric will peak their curiosity. There’s a peephole in the longer tunnel and a dangling ball toy in both. They collapse for easy storage and easy to pop open when your cat is ready to play. Bergan’s famed Turbo Scratcher cat toy will give your cat infinite periods of fun! The Turbo Scratcher contains a channel for a small ball that your cat can bump with its nose or push with its paw. The scratchpad of the Turbo Scratcher is durable and can be replaced if needed. Includes 1 base (16″ diameter), one scratch pad and one ball. Get a cat toy that encourages an active lifestyle. Just place the ball on the track for hours of fun and give your cat something to scratch other than your furniture! 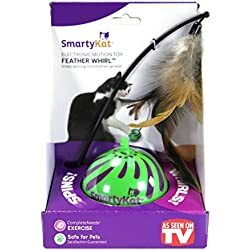 Let your feline play with this cat toy that will give them hours of fun and exercise. These fur mice come in realistic colors, have felt noses and eyes, and real fur. To fulfill your cat’s natural hunting instinct, hide a few around the house! This fantastic electronic cat toy replicates the movements of hidden prey with unpredictable moving wand under the durable fabric. Your cat will be fascinated each time as you rotate the four speeds and two replaceable wand attachments. A cat toy that encourages healthy activity through play. The plastic wands and base are made from recycled plastic. Don’t forget to give your cat the gift of good health by making annual preventive care visits with your veterinarian, and providing proper nutrition and exercise. Remember to keep the cords rolled up and the tinsel off the tree!